The news keeps getting brighter for real estate in Breckenridge, Colorado! We’re currently experiencing a growth in prices, a rise in inventory and some very attractive surges in contract activity. You really can’t ask for much better than that for this month’s Breckenridge real estate market update. It’s intriguing to note, though, that the significant increase in under contract activity seems to be more on the north side of Summit County. To date, the north end is seeing an 18 percent boost, which translates to 65 percent of the properties located here under contract. On the other end of the spectrum, the south side has 35 percent of its listed properties under contract. While those numbers are lower, it’s still good to see positive movement happening in the southern end of the county. Even with this discrepancy between the two sides, however, overall sales today are at the same level as they were last year at this time. 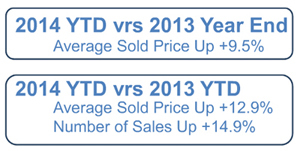 Finally, I want to point out that Breckenridge is leading the pack when it comes to sold homes. Right now, this town has closed on 255 properties. Silverthorne is the second place winner with 111 properties. All in all, it’s a good time to explore real estate in Breckenridge and Summit County as a whole. I’ll keep monitoring the market and posting updates whenever possible. Any time you’re preparing to buy or sell a home, the latest reports are always important resources. I routinely tell my clients to check the market so they are aware of any changes around them. I also caution clients that Breckenridge real estate market can switch directions quickly. You should be careful not to draw conclusions based on just one market update. Every market has its own rhythm. That’s why you need to get to know the patterns in your area. Don’t hesitate to contact me if you’d like to understand your market better. Also, if you want to view homes that are for sale in Breckenridge or any other town in Summit County, I’m happy to put together some properties that might suit your needs. Feel free to browse through the updated listings on my website as well. Then we can talk about the homes that interest you together.